Special Report: Boston PD Hearkens Back to Urban Shield Training During Marathon Attacks — Cytel Group, Inc. Standing in the middle of Boylston Street at 3 p.m. on April 15, the choking stench of sulphur in the air, hundreds of runners and spectators scrambling for cover, and dozens of maimed victims lying sprawled on the sidewalks, Boston Police Superintendent-in-Chief Daniel Linskey knew the city’s EMS services just weren’t going to be enough to handle the chaos. With multiple EMTs trying desperately to save the lives of victims wounded by one of two explosions at the finish line of this year’s Boston Marathon, Linskey immediately realized there was no way possible there would be enough ambulances available to be able to transport the hundreds of victims to nearby hospitals. At that point, with his fellow police commanders yelling for assistance and issuing orders over a blaring police radio, Linskey suddenly hearkened back to a training he had participated in twice during the previous two years, Operation Urban Shield. He remembered one of the scenarios that Urban Shield drill organizers had laid out before participants – being hopelessly overwhelmed by a mass casualty event. The solution hit him instantly. He got on the radio and called for all available police patrol wagons to come to the scene to help transport victims – it didn’t matter that they weren’t EMS vehicles, they could immediately transport the wounded to over a dozen of Boston’s hospitals. Without a doubt, that split-second decision saved lives. "Urban Shield wasn’t about just running through scenarios, it was about making us think big. Bigger than we had ever thought before,” said Linskey. “And standing there on Boylston Street as bomb experts were checking out dozens of bags that had been left abandoned, watching people trying to save lives all around me, it didn’t get any bigger." Linskey said the events of April 15, not to mention the subsequent four days that gripped New England with an historic manhunt for two terrorism suspects, tested the response capacity of multiple police, fire, and EMS units like never before. And yet leaders who were in decision-making roles during tactical deployments over those five days were able to repeatedly draw upon lessons they learned in drill exercises staged the previous two years in Boston, thanks to the city’s participation in the Urban Shield program. We’d done exercises of all types over the years,” Linskey said, “but the majority of them were tabletops where we’ve got a bunch of specialty people who stood back and watched as fake dramas unfolded. But they’re not real, there’s no skin in the game. After the SWAT members of the Boston PD went to Alameda County and participated in Urban Shield, everything changed. Urban Shield made us realize we needed to do cross-training with our partners in fire and EMS service, to learn what would happen when we all showed up at a scene together and had to deal with something the likes of which we’d never seen before." During the Urban Shield training exercises, including one staged at the Boston Marine Industrial Park, part of the scenarios thought up by the “evil geniuses” who scripted intensive scenarios that would tax all of the first responders, Boston had to contend with staged attacks from the sea, and multiple scenes where bombs were exploding. The exercises were funded by the Urban Area Security Initiative. "These were things we never figured we’d have to contend with in Boston, until the Friday after the Marathon, when our officers were pursuing the two suspects, and they’re telling me Chief, they’re throwing bombs at us. It wasn’t like our officers had a lot of street experience with bombs being tossed at them." "Luckily, once again, we had the lessons of Urban Shield to fall back on and help us craft a proper response,” Linskey said. Boston Police Chief Daniel Linskey on scene with his Tactical team. All of our training has helped us not just learn to communicate better among ourselves in public safety, but also with our public. Boston Police Superintendent William Evans said training exercises like Urban Shield taught our police department to make sure to keep its community informed throughout an emergency, something the BPD was hailed for nationally during the days after the Marathon attacks, especially for our use of social media applications such as Twitter to instantly share information. "Urban Shield helped teach us how to deal with the public in a way that wasn’t overly aggressive, even while we were doing SWAT operations and tactical deployments,” Evan said. “Our calm, measured response while searching dozens of homes in Watertown looking for the two suspects, helped us allay the fears of those community members." But the Boston Police Department cannot rest on its laurels. We need to continue moving forward. We learned things from the Marathon attacks about radio communication shortcomings, the greater need for electronic surveillance, and the mandate for enhanced coordination of intelligence gathering. Urban Shield caused us to apply pragmatic problem-solving to our emergency situations. It was that type of decision-making by the men and women who were our first on the scene that helped save the lives of innocent victims of these reprehensible attacks. The lessons learned from the Boston Marathon attacks need to be incorporated into our tactical plans moving forward. Detailed after-action plans are underway that will help us review from a myriad of fronts how we approached the attacks on our city and its people on that Monday afternoon, and indeed, the days and weeks that followed. We cannot expect that our resources will never be taxed like that again. If the attacks on Marathon Monday taught us anything in Boston, it was to imagine the unimaginable, to think the unthinkable. Thanks to Urban Shield, we were already doing that imagining and thinking. 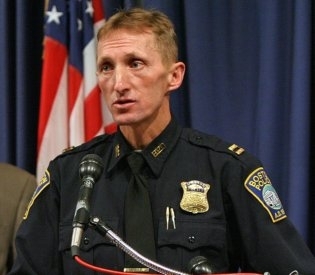 Edward F. Davis, III is the Commissioner of the Boston Police Department.